August 22, 2016 • Middletown, Portland, Who Knew? 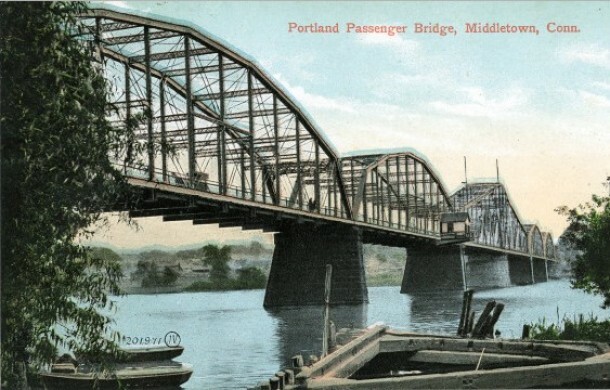 … that in 1896, when the Middletown and Portland Bridge over the Connecticut River opened it was the longest highway drawbridge in the world. Built by the Berlin Iron Bridge Company for $180,000, the bridge measured 1,300 feet long with a draw span of 450 feet. It provided a roadway and an electric passenger car, accommodated foot traffic, and charged for the crossing. With a wagon: 12 cents. Four horses and wagon: 30 cents. A cow, ox, or mule: 3 cents. Sheep, swine, or goats: one cent each. The ferry boat Brown-Stone, which provided service for fifty years, made its last crossing across the Connecticut River on April 12, 1896, the day that the bridge officially opened. Badly damaged in the 1936 flood, the Arrigoni bridge, opened in 1938, replacing the Middletown and Portland Bridge.